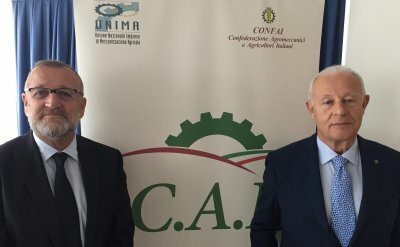 After a patient work started in 2013, UNIMA and CONFAI, representing both agricultural and rural contractors in Italy decided to officially create on 27 may a new organisation: Confederazione Agromeccanici e Agricoltori Italiani (CAI). The organisation represents 18,000 companies of agricultural contractors and some thousands of farmers in the whole, with a production value of â‚¬3.7 billion (source: Istat). "Today we are completing an integration path that began in 2013, with the establishment of Confederazione Agromeccanici e Agricoltori Italiani declared Gianni Dalla Bernardina. I take over the presidency of this organisation with the awareness that for achieving sustainable growth goals, the agricultural world must aim at ever-increasing levels of integration: in this sense, agricultural contractors are a powerful tool for creating meeting and collaboration areas among the different protagonists of the rural world." Today, some 18,000 contractors are operating in Italy, of which 10,000 are working in favor of about 1 million farms, accounting for more than 65% of agricultural operations carried out by machinery (with tips exceeding 98% for harvesting of cereals, 70% for harvesting of industrial crops [such as tomatoes or beetroot] and 70% of the application of crop protection treatments. According to data from the latest census in agriculture, 212,000 farms (13% of the total) have completely entrusted their management to agricultural mechanization firms, equivalent to 1 million hectares under the responsibility of contractors. Support activities and secondary activities, generates a total value of 10.6 billion euros (given: 2015, source Crea), up 24.8% over 2010. Confederazione Agromeccanici e Agricoltori Italiani represents over 85% of the companies and consists of six regional federations (Lombardy, Veneto, Emilia-Romagna, Piedmont, Tuscany, Marche), 55 regional associations. CEETTAR wishes to welcome the establishment of this new organisation. "Italian contractors demonstrate again the dynamism of our industry in their country but also in Europe" declared Klaus Pentzlin, president of CEETTAR. '"Silvano Ramadori, president of UNIMA, and Leonardo Bolis, president of CONFAI, have done a wonderful work. CEETTAR and its member organisations will bring its full support to the new organisation to help further development and will be happy to welcome Gianni Dalla Bernardina, the elected president of CAI at the our next meeting in Finland.